We are all too familiar with this statement. Which explains why for a milestone as significant as your proposal, choosing the right diamond for your engagement ring is important. You want something that sparkles and lasts through time, symbolic of your marriage. But even though diamonds have long been a big part of engagement proposals, we find that most are not aware of the intricacies when it comes to choosing them. In our earlier issue ‘How to Choose an Engagement Ring’, we shared the basics we learned from JannPaul about the diamond 4Cs, GIA certification and how you can very easily customise your own unique ring. For our own proposal, when it came to the uphill task of purchasing a diamond ring, we were very thankful for their free education and consultation session aimed at improving customer knowledge. It was refreshing to find a vendor focused on benefitting customers rather than closing the sale. We were surprised also by how they made a seemingly technical topic interesting to us. After all, we consumers only have one goal in mind – to get the most sparkling diamond at its best value! As straightforward as that may sound, there is more than meets the eye. But for now, I will give you the short and quick answer to that – Super Ideal Cut diamonds. After all, we consumers only have one goal in mind – to get the most sparkling diamond at its best value! Needless to say, when it came to taking our diamond knowledge to the next level, we reached out to Casey from JannPaul, this time to learn more about super-ideal cut diamonds, the definition and their methodology behind it, for these are the diamonds that JannPaul prides on carrying. Read on to find out what we learned (and you should too!). 1. First up, what is a Super Ideal Cut Diamond? A Super Ideal Cut is a very tight set of proportions that will enable the diamond to return maximum and majority of the light – allowing it to essentially sparkle at its brightest. We can all agree that the most captivating part of a diamond is its sparkle. The secret to the sparkle lies in its cutting above other factors. The cut here does not refer to the shape of the diamond, but the proportions, polish, and symmetry. A proportioned cut will allow the light to transverse through the diamond in such a way that reflects back to your eye with an incredible fire and brilliance (instead of simply going through the diamond, causing it to look dull). A well-cut diamond can also appear larger and brighter than it is. A Super Ideal Cut is all of the above but done to greater scrutiny. The secret to the sparkle lies in its cutting above other factors. We were surprised to learn that only a small percentage of diamonds in the world are cut to the Super Ideal Cut standards (less than 0.001% of the world’s diamond supply). Thankfully, JannPaul specialises in them, so from them, we learned how to spot Super Ideal Cut diamonds. Casey showed me 3 diamonds with almost identical GIA certificates. Initially, I was quite certain they could not be that different from each other. But in actual fact, upon a closer comparison, the 3 diamonds, in reality, performed very differently – simply because of its cutting. We then learned that cutting hugely determines a diamond’s light performance. As customers, we must note that the GIA certification of a diamond alone is not enough to tell the whole story. The GIA certification of a diamond alone does not tell the whole story. These 3 diamonds in a shop would be of similar pricing because their GIA certificates are almost identical. But if you did not happen to pick the super-ideal cut diamond, it means you will not be getting the diamond that sparkles best despite paying the same price. Watch the video below to see the difference for yourselves, between a Super Ideal Cut diamond vs an Ideal Cut vs a GIA Triple Excellent. A tricky issue that non-experts like us face is we are often impressed with the sparkle of any diamond. We are unable to tell the difference as we look at each diamond individually. So, the key here is to compare different diamonds under scopes and spotlights, side by side. Only then will the difference in sparkle become apparent to our naked eye. At JannPaul, every customer is taken through a process of looking at their diamond (and others) under the ASET (Angular Spectrum Evaluation Tool) & Ideal scope. It allows you to see the light return and leakage. Watch the video below to see different diamonds being compared with the Ideal Scope and in real life. 3. How do you get Super Ideal cut diamonds? Getting Super Ideal Cut diamonds requires heavy scrutiny. In order for a diamond to be perfectly symmetrical, every facet alignment has to be taken into consideration. The diamond has to be cut to a precision that allows it to perform to its fullest potential of reflecting light. ‘Overall light return’ is no longer sufficient when it comes to the Super Ideal Cut. As the GIA certification categorizes the diamond cut in a broader manner like ‘excellent’, you cannot ascertain whether your diamond is of the top or bottom tiered of ‘excellent’. Hence, taking the information from the certificate alone is insufficient. In the case of JannPaul, their methodology leds them to only pick out top-tiered ‘Excellent’ grade diamonds, such as the Super Ideal Cut, for sale to customers. The diamond has to be cut to a precision that allows it to perform to its fullest potential of reflecting light. That is why you should always pick Super Ideal Cut diamonds. Unfortunately, in the industry, this term is highly misused due to the lax regulations around usage of the terminology. What we customers need to learn is what defines a Super Ideal Cut diamond, so that we can spot them. It is important to be informed and educated when it comes to buying something as expensive and significant as a diamond ring. Additionally, make sure that the jeweller you seek is able to use tools to support any claims of Super Ideal Cut diamonds, as well as claims on their main characteristics – brilliance, dispersion, and scintillation. That flash of white light you see when light shines on a diamond? That sparkle is the diamond’s brilliance. A diamond’s brilliance is attributed to a right combination of brightness and contrast. Brightness refers to the light reflecting in and out of the diamond towards your eyes. Contrast is what causes the diamond to have a beautiful patterning. The aim here is not to pick a diamond with light leakages (diamonds cut too wide or deep will result in a dull look). To see if your diamond has brilliance, check it using the ASET scope under a fluorescent light. Watch the video below. As light travels through the diamond, some light rays are separated into flashes of colour, like a rainbow. This dispersion of light rays results in the fire of the diamond. The fire mostly comes from the contrast areas of the diamond. More contrast areas give the diamond a greater fire. Fire can be observed through the ASET scope. Watch the video below to learn how. Scintillation is the movement of fire where you can see intense sparkles moving around the diamond as you shift it. Ideally, you will want your diamond to have many flashes spreading across its surface. A higher number of facets can lead to a higher scintillation. However, the downside of too many facets will result in a smaller fire as each facet’s surface area is smaller. Ultimately, it boils down to personal preference whether you prefer a bigger fire or higher scintillation. I personally prefer the Super Ideal Cut as it has a balance of both factors, and who doesn’t love a more intense fire! Scintillation is also the pattern of dark and light facets that you can see when moving the diamond back and forth. This is due to the rate of change in brightness and contrast. Patterned scintillation is beautiful as it adds character to your diamond. The aim here is to pick a diamond with brightness and contrast that is evenly distributed. The consistent patterning of a diamond leads to it being more attractive and eye-catching. Watch the video below to see how you can see the patterned scintillation with the ASET scope. As a matter of fact, it was a challenging journey for JannPaul to carry high-quality Super Ideal Cut diamonds for customers. It was neither easy nor straightforward a process when it came to finding competent suppliers who were willing to cut to their stringent standards. Partners Casey, Jann, and Paul were adamant in their mission. Determined to raise the diamond standards and customer knowledge in Asia, the team of 3, steadfast in their methodology and standards, relentlessly sought to seek out a way. Eventually, after much efforts, they managed to find cutters who could consistently and reliably cut according to JannPaul’s required specifications. JannPaul was the first jeweler to bring the term Super Ideal Cut into Asia. Today, with their service-oriented approach, education sessions and high-quality diamonds, they have grown to become one of the most notable names in the industry. Knowing how complicated the diamond picking can be, I had to ask what JannPaul’s process was – their secret sauce. From my experience, many vendors tend to be secretive about their methodology – after all, it is proprietary information. On the other hand, Casey was very open and transparent about sharing theirs. It was very much aligned with their vision of how they want their customers to know exactly what they are buying, before putting their hard-earned dollars on the table. Here is the 7-step methodology that JannPaul takes in selecting their range of diamonds (not limited to Super Ideal Cut) for their customers. Though certification does not tell a diamond’s entire story, it is still required and important for diamonds to be graded and certified by a reputable company. Avoid buying diamonds without a certification. JannPaul carries only diamonds that are GIA (Gemological Institute of America – Gem Trade Laboratory) or AGS (American Gem Society) certified. When posed the question why JannPaul does not include EGL (European Gemological Laboratory) certified diamonds as well (since it’s one of the most important gem labs in the world), we learned GIA/AGS has by far the greatest reach in comparison with any other lab. GIA was the lab who created the diamond grading system that is now used all over the world by other labs. While AGS is offering the unique 0 to 9 cut grade scale (0 being termed as the “ideal). Reputable and held in very high regard, the certificates from GIA & AGS are trusted by millions of diamond consumers and companies worldwide. There are also other grading labs such as The Diamond High Council, International Gemological Institute, European Gemological Institute and many more, but in comparison to GIA/AGS, they do not carry as much authority and reputation. Hence, we consumers should be careful when shopping for diamond rings with certification other than the GIA/AGS. Carat weight as we all know is precious as it measures a diamond’s size. Bigger diamonds are rarer than smaller ones and hence with all factors (cut, clarity, and colour) constant, a 1-carat diamond will be worth more than 4 quarter-carat stones put together. JannPaul does not carry flat carat weights in their diamonds just in order hit higher tiers (to charge more). This ensures that their customers get even better value for their purchase. A colorless diamond is of higher quality. JannPaul ensures to check the diamonds they carry fall into the colourless category, D-G. As the diamond goes down the scale, it will start to depict a yellowish tint, which does not look as pure in comparison. Virtually all diamonds contain small imperfections called inclusions, due to them being formed under intense heat and pressure deep in the earth. But the last thing you want to happen is to spend a bomb on your diamond to have come with many imperfections. These imperfections are called blemishes (on the surface) or inclusions (inside the diamond). As such, JannPaul ensures not to carry diamonds that cross the VS2 category. Though you may not be able to see the inclusions with your naked eye for SI1 and SI2 categories without a scope, having inclusions in a diamond will affect the shine and sparkle that we so desire. More importantly, as minor inclusions may be unavoidable, if they are present, JannPaul ensures to not carry those with inclusions that sit at the girdle of the diamond, as this might result in the diamond being more vulnerable to cracks. Knowing that the ladies will be wearing their ring throughout their daily lives, a diamond has to be tough as much as it has to be beautiful. Hence, if the inclusions is in the diamond girdle, JannPaul is unlikely to accept it. Inclusions if present at the top or middle of the diamond, will dramatically affect the diamond’s light performance as well. Fluorescence is the glow that a diamond exhibits when exposed to ultraviolet (UV) light. Though present in only 20-35% of diamonds (source), JannPaul ensures to take note that their diamonds contain no fluorescence, to not influence the diamond colour. When choosing your diamond, we recommend avoiding fluorescence, as there will be a risk that your diamond will end up looking hazy or cloudy. For more information on fluorescence, check out this more extensive guide by GIA here and here. As this entire article shares about Super Ideal Cut diamonds, you now know that diamond cut is the most important factor to consider for diamond sparkle. To ensure good cut quality, JannPaul ensures to use the Holloway Cut Advisor (HCA) tool to reject diamonds that are not cut with proper proportions. 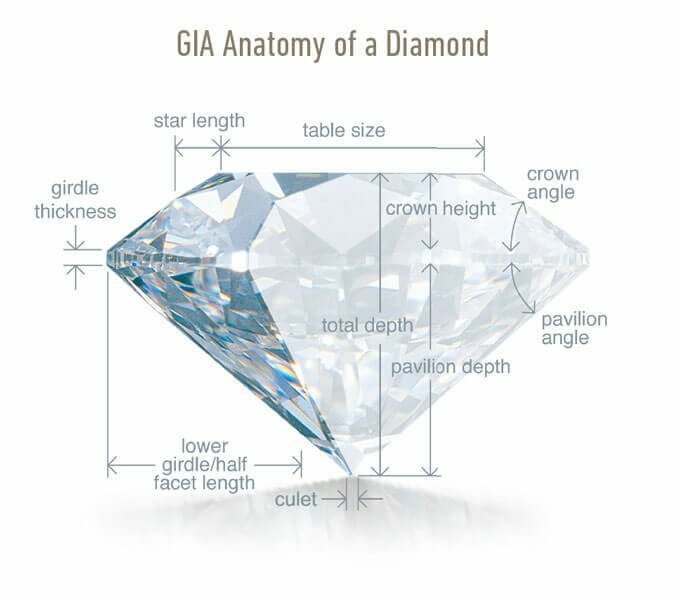 A diamond’s HCA score is calculated by entering the values obtained from its GIA certificate, allowing the team to eliminate the badly cut ones. Do note that the HCA is a rejection tool and not an acceptance tool. Also, it can only help you narrow your search for round diamonds. If you are wondering why poor cut diamonds exist, it is because cutters often place too much focus on carat weight. As prices sharply increase for a bigger carat diamond, cutters lean to preserving as much of the weight they can during the cutting process. In addition, if striking inclusions are found in the diamond, cutters would want to cut it out but at the same time preserve more weight, resulting in a badly cut diamond. Using the ASET scope, JannPaul carries diamonds with hearts and arrows and patterned scintillations, to enhance the light performance of the diamond. A symmetrical diamond will require superior craftsmanship and a high level of precision to cut the diamond. Optical symmetry refers to how the facets of the diamond align with each other internally. Light shone on a symmetrical diamond will be reflected well as it interacts with the facets, due to the consistent angles. In short, it means that your diamond will sparkle better and brighter than another of lesser. JannPaul carries only diamonds of good optical symmetry, and you can see it through the Hearts and Arrows scope. The more even the pattern, the better the optical symmetry of the diamond. Do note that good optical symmetry is not limited to round diamonds, but fancy shaped diamonds can potentially also have high levels of optical symmetry. 7. The conclusion – Why Super Ideal Cut? Shopping for your diamond ring, like your proposal is a once in a lifetime affair. You want this significant and meaningful moment to be perfect. However, finding the right diamond is more than picking out the biggest one. Do plenty of research and ensure to educate yourself, as it is vital to ensuring that you make a well-informed purchase, to not get lesser than what you paid for. Do check out JannPaul’s education videos here on Youtube to learn more about how to pick out good diamonds. After my education session with Casey, I realised that learning about Super Ideal Cut diamonds helped me know how to identify a good quality diamond. Typically people focus a lot on carat weight, but in actual fact, the diamond cut is the factor that you should never compromise on. Super Ideal Cut diamonds, thanks to the cut precision will shine brighter, bolder and even look larger in size. We hope through us sharing our education session with JannPaul, you will be able to better recognise good quality diamonds too, for your own purchase. This post was brought to you by JannPaul. Any contributions? Email us at [email protected] for details. For advertising, please email [email protected]. Click here for more information. If you need any help/services, email us at [email protected]. We’d be happy to help!